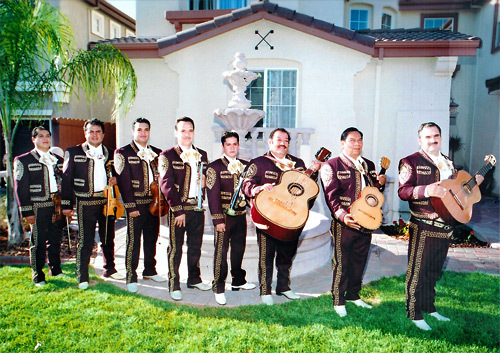 Mariachi Jalisco was founded in 1987, and has since become one of Bay Area's premier Mariachi groups. They can be heard playing the traditional Mariachi repertoire, allowing their audiences to experience the rich culture that Mexico has to offer. With a song list consisting of no less than 2000 tunes, they are guaranteed to be a hit at your next event! Mariachi Jalisco is led by Se?or Orozco, who is originally from San Miguel el Alto, Jalisco, Mexico. Born July 29, 1958, Se?or Orozco studied guitar in Mexico before immigrating to Northern California in the late 70's. At first, he held down a variety of odd jobs, all while playing with local Mariachi groups. In the late 80's, he decided to form Mariachi Jalisco, and more than 20 years later, his group continues to make waves throughout Northern California at weddings, church events, cultural festivals, and parties of all types.